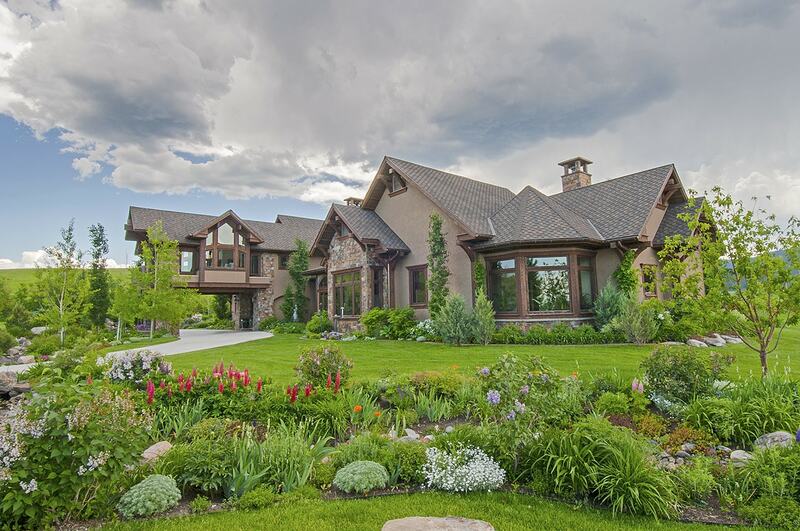 The summer season is just beginning in Bozeman and luxury real estate is already hot. 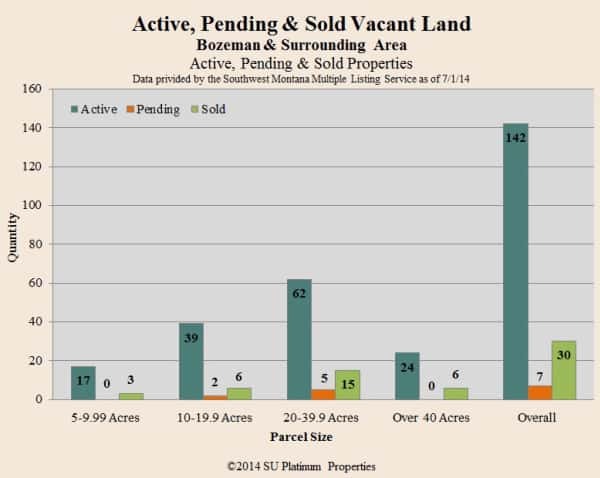 The number of potential buyers cycling through Bozeman has not significantly increased, but their intent to buy and willingness to sign contracts is far stronger than it has been in the last 6 years. 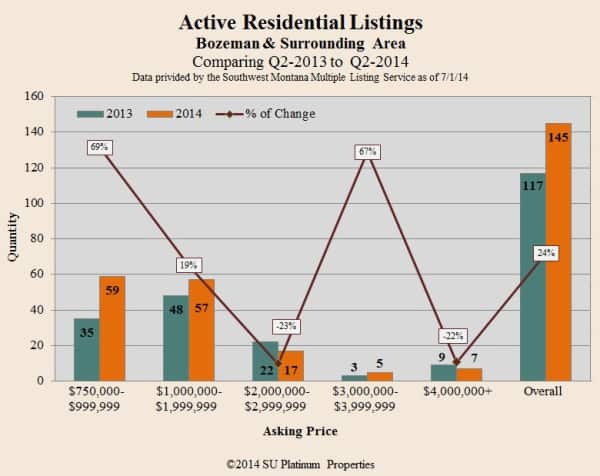 Sales for high end homes ($750,000 and above) Areas 1 & 2, Gallatin Valley, Bozeman continue to gain strength in the 2nd Quarter of 2014. A flurry of homes have gone “under contract” as this quarter ends. There are 16 pending sales of homes priced $750,000 and above. Of those, 10 are in the $750,000 to just under a Million price range. 3 of these properties are Block M, Downtown, and 3 are Black Bull, demonstrating buyers’ desire to simplify their lives with luxury properties requiring little maintenance and a built-in community. Also noteworthy is that 3 of the pendings are over $2 Million. 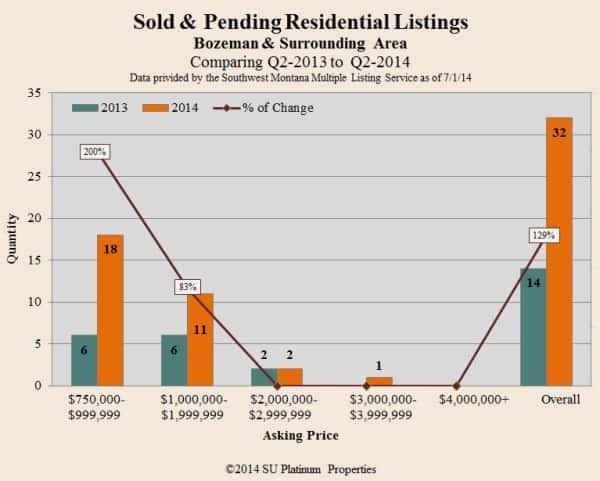 That said, Bozeman remains a small market, with every sale being noteworthy and changing the statistics. The market is fluid, gaining momentum, and trickier than ever to navigate. Buyers and sellers more than anytime in the last 6 years need a real estate professional who can guide them, are interested in long term relationships rather than a quick sale, and are up-to-date on all aspects of the face-paced single-family market. It is vital to work with an agent who knows the present inventory and the pricing of recently closed properties. Buyers need to understand the value of the land, the cost per square foot to build, the additional costs of an architect, engineering, and the building time frame, as well as what the present market dictates. Sellers need sound advice in arriving at their listing price. Sellers are most successful when their property is priced within 10% of what the current market will bear as buyers, and their agents, have little interest in viewing properties they consider to be over priced. Few buyers are willing to make an offer if they feel the property is unrealistically priced. The days of “low-balling” are currently over. Now it is negotiating, and buyers won’t begin a dialog with a seller they consider to be way off base. Closed & Pending Transactions Have Increased! As of June 30, 2014, according to Southwest Montana Multiple Listing Service, 32 properties, priced $750,000 and above in Areas 1 & 2, closed or are pending. This represents a 228% increase from this time period last year. However, the numbers are small—32 now compared to 14 in 2013. And, only 3 properties listed $2 Million and above have closed. However, Platinum Properties has gone under contract on 2 properties priced over $2 Million in the last week! And one of them is just under a $4 Million contract price, so we are feeling bullish. Homes priced $750,000 and above, Areas 1 & 2, totaled $13,204,579 in closed volume for the 2nd Quarter 2014. The list price for these closed transactions totaled $14,324,400, which yields an average of 92% of Asking Price to Closing Price. 56% of the closed transactions were for homes priced under $1 Million. Price points matter! The higher the price of a property, the fewer buyers. Period. We continue to have the highest transaction for the year. Vacant land sales is gaining a good deal of traction, especially considering how flat it has been for the last years. A total of 798 acres sold by the end of the 2nd Quarter this year, with a total sales price of $9,583,785. The properties averaged 86% of their asking price, however, parcels of 40 acres and above only averaged 76% of their asking price. At Platinum Properties, we pride ourselves on client focused, concierge-level service, combined with professional advice and honed negotiating skills. We are first and foremost experienced experts in the marketing and purchasing of high-end residential properties in Bozeman. We are very successful, due in no small part to always striving to improve our performance and standards. Until recently, we have stated “100% Client Satisfaction” in marketing materials. However, in these volatile times, we find it increasingly difficult in certain situations to meet seller expectations. A number of sellers are convinced their property is worth more than the current market will bear. Their property probably is worth what they think, but “worth” and “replacement costs” are not the driving market force. Yes, the market has dramatically improved, but it has not recovered to pre-2006 levels of pricing. Buyers today are knowledgeable, opinionated, and willing to walk away from a property they feel is over priced or does not meet their expectations and standards. Buyers know what fine homes are selling for on a price-per-square-foot, and they know present land values. They are not focused on future pricing, but on what they are willing to pay today. Both buyers and appraisers rely on comparable sales. Prices are slowly inching up from the market collapse, but high end properties in Bozeman are still 20% or more below the 2006 pricing. If you want to take advantage of this current market and sell your property, the first step is listing your property for today’s market.